The Alameda County Civil Grand Jury investigating Emeryville’s attempt to discount a loan given to the developer of the Bay Street Mall said the city “did not perform adequate due diligence, did not retain experts … and lacked the expertise” to approve such a deal. The deal, originally proposed by developer Madison Marquette and based on prepayment of the loan in full, would have let the developer repay only $12 million of an $18 million loan. “It is troubling to the Grand Jury that the city would commit to such a significant financial decision based upon insufficient research into best practices and accepted industry standards. In determining their options, decision-makers were seemingly blinded by the opportunity to generate immediate cash,” the Grand Jury said in its final report, released today. The Jury heard testimony from an expert on valuing such transactions. When asked if he had ever seen a loan prepayment calculated in such a way, “the expert responded emphatically, ‘Never,’” the Jury report said. 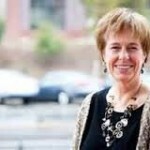 Helen Bean, Emeryville’s former Director of Economic Development and Housing. 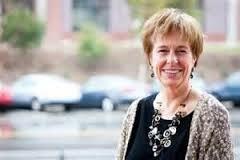 The City Council majority voted to support the loan discount based on information she provided. Luckily, according to the Grand Jury, Emeryville’s Oversight Board refused to approve the loan. The county-level Board is charged with monitoring the city’s transition after the elimination of state redevelopment money. The law required its OK in order for the loan deal to go through. The Grand Jury launched its investigation in response to a citizen’s complaint. Emeryville City Attorney Mike Biddle (left), who advised the City Council to support the discounted loan, and former City Manager Patrick O’Keeffe, who was well-known for making decisions and recommendations favorable to developers, often at the expense of the city and its residents. The City Council had voted 3-2 to allow Washington DC-based Madison Marquette to repay just $12 million on a promissory note owed to the city’s former Redevelopment Agency for $18.3 million. 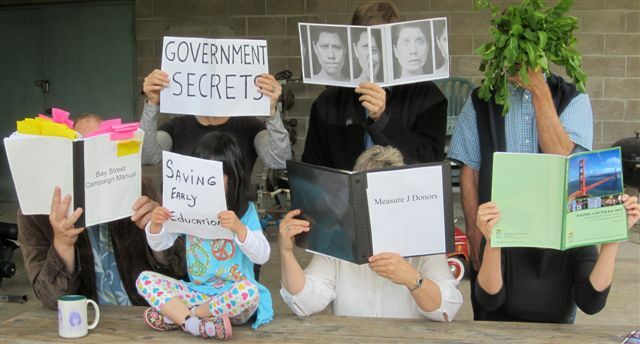 The City Council majority (Ruth Atkin, Nora Davis, and Kurt Brinkman) supported the loan discount, while Council members Jac Asher and Jennifer West voted against it. The City Council thought it could forgive $6.5 million of the loan based on information provided by Helen Bean, Emeryville’s Director of Economic Development and Housing, who has since retired. In an April 2013 memo to the Council, Bean argued that the value of the $18 million balance, at a 7 percent capitalization rate, equals the payoff amount of just $12 million. “In addition, it is unclear whether city staff ever reviewed the developer’s financial statements to establish the previous years’ poor performance, or merely relied on unsubstantiated figures provided by the developer,” the Grand Jury said. The Grand Jury received a complaint from a resident of Emeryville regarding a decision of the Emeryville City Council to allow a private shopping center developer to prepay in full the then $18.3 million outstanding principal balance of a 25-year promissory note. The note had a fixed interest rate (i.e., the interest rate does not change, or “float,” over the term of the loan) payable to the city of Emeryville for $12 million, an approximately 30% discount from what was owed. The developer suggested (and the city council agreed to) an unorthodox method for calculating the prepayment amount. According to accepted financial practices, the prepayment of a loan with a fixed interest rate is calculated so that if the prepayment is invested by the lender at current interest rates for the remaining term of the note, the full outstanding balance of the note will have been repaid by the original maturity date. The developer’s suggested approach would not have resulted in the total principal balance being repaid. The city council agreed to the prepayment as proposed by the developer. 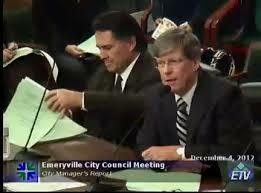 However, the law required prior approval by the city of Emeryville oversight board. Notwithstanding the recommendation of the city attorney supporting the prepayment, the oversight board relied on a memo from its outside legal counsel and did not approve the prepayment. The Grand Jury heard testimony and concluded that the city did not perform adequate due diligence, did not retain experts for assistance and admittedly lacked the expertise to determine if the developer’s proposal was fair to the city. However, the oversight board, in performing its legislated duty to review the decisions of the city council, did not approve the proposed prepayment. On September 23, 1999, the Emeryville Redevelopment Agency entered into a purchase and sale agreement to sell to a developer certain real property owned by the agency on which a shopping center was to be developed. Subsequently, on June 11, 2001, pursuant to the purchase and sale agreement, the developer acquired the subject property for $25.5 million, of which $1.8 million was paid in cash and the remaining $23.7 million balance was to be repaid pursuant to a promissory note payable to the city over 25 years. In addition to fixed interest payments, the promissory note contained a contingent interest component pursuant to which the city would also be paid an agreed percentage of the shopping center’s net operating income in excess of a certain annual dollar benchmark. Effective January 1, 2012, Assembly Bill 26 required the dissolution of all redevelopment agencies in California, and the transfer of their respective assets to a “successor agency” selected by the city council of each municipality. To comply with the new law, the Emeryville City Council on January 17, 2012, selected the city of Emeryville (i.e., itself) to serve as the successor agency for the recently abolished Emeryville Redevelopment Agency. In addition, the new law established an oversight board for each municipality to review the winding down of each redevelopment agency by the successor agency. In the first half of April 2013, the developer submitted to the Emeryville city manager a proposed Letter of Intent to prepay the $18.3 million then- outstanding principal balance of the promissory note for a total of $11 million. On April 16, 2013, the city council adopted a resolution authorizing the city manager to sign the Letter of Intent pursuant to which the promissory note would be prepaid for $1 million more than offered by the developer (for a total of $12 million). A revised Letter of Intent dated April 16, 2013 was signed by the city manager and the developer to prepay the promissory note for $12 million. On May 21, 2013, the city’s Economic and Housing Department wrote a memo to the city attorney recommending that, in accordance with the Letter of Intent, the city enter into a Note Prepayment Agreement with the developer to prepay the promissory note for $12 million (which was approximately $6 million less than the outstanding principal balance). On the same date, the city attorney wrote a similar memo to the interim city manager making the same recommendation. The Economic and Housing Department also wrote a memo dated July 2, 2013, that was substantively identical to its May 21 memo to the city attorney. 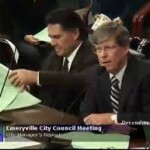 On the same date, the Emeryville City Council adopted a resolution authorizing the Note Prepayment Agreement. One week later, the Grand Jury received the citizen complaint. Once the city signed the Note Prepayment Agreement, the city attorney wrote a memo to the oversight board recommending approval. However, in a memo dated the same day, outside legal counsel for the oversight board recommended disapproval. Notwithstanding the recommendation of the city attorney to approve the Note Purchase Agreement, the Grand Jury heard testimony that the oversight board agreed with its outside legal counsel and did not approve it. methodology for calculating an appropriate prepayment amount. The Grand Jury heard expert testimony that prepayments are typically calculated so that, if the prepayment sum is invested at current interest rates until the original maturity date, the lender would receive the entire principal balance due (i.e., the prepayment sum plus interest earned at the then-current rate over the remaining term of the note will equal the total owed to the lender). However, as discussed below, the method used by the developer would not have made the city whole. Specifically, the developer proposed calculating the prepayment sum by discounting the outstanding balance of the note by 6%, which was the “capitalization rate” used to value shopping centers for investment or purchase. The capitalization rate is the net operating income of a property divided by its purchase price. The resulting percentage is then compared to the capitalization rate for other similar properties. The developer supported its position by providing an opinion from a real estate advisory firm who confirmed that most shopping centers were being sold at the time at a 6% “cap” rate. However, the developer only asked the real estate advisory firm for the shopping center cap rate, not for the usually accepted method for calculating a prepayment. The Grand Jury learned that city staff involved in the transaction did not have a background in finance and were unfamiliar with the methods for calculating a prepayment. Similarly, the Grand Jury heard testimony that city staff had not previously used a cap rate to calculate a prepayment. Further, the city did not retain its own expert, but relied instead on an unpaid advisor who confirmed that 6% was indeed the current cap rate for shopping centers. Additionally, in the memos to the city council, the director of the Economic and Housing Department and the city attorney concluded that the contingent interest portion of the note (pursuant to which the city would also be paid an agreed percentage of the shopping center’s net operating income in excess of a certain annual dollar benchmark) had no value over the remaining 11-year term based on their conclusion that the shopping center had not performed as originally projected. However, the Grand Jury learned that the city only took into account the previous operating history of the shopping center (which included the worst real estate devaluation in decades) and it appears the city did not sufficiently take into account the likelihood that the economy would improve and the shopping center’s net operating income would grow over the remaining term of the note. In addition, it is unclear whether city staff ever reviewed the developer’s financial statements to establish the previous years’ poor performance, or merely relied on unsubstantiated figures provided by the developer. The Grand Jury concludes that the city of Emeryville failed to conduct appropriate due diligence to determine if the method suggested by the developer for calculating the prepayment of a fixed interest rate loan was the proper method. Furthermore, the Grand Jury also concludes that city staff lacked the expertise to make such a recommendation on their own. Fortunately, the oversight board chose not to approve the Note Prepayment Agreement for the reasons outlined in this report. Although the review of the city’s actions by the oversight board clearly worked in this case, it is troubling to the Grand Jury that the city would commit to such a significant financial decision based upon insufficient research into best practices and accepted industry standards. In determining their options, decision-makers were seemingly blinded by the opportunity to generate immediate cash. In the future, the Grand Jury would hope that decision-makers would recognize when more data and expert advice is required to fulfill their fiduciary duty to the citizenry. Although the Grand Jury is critical of Emeryville’s failure to conduct the proper due diligence, it is apparent that the statutory framework requiring review by the oversight board functioned as intended. Why did it take a grand jury to determine that this forgiveness was unlawful? Thanks to Jac Asher, Jennifer West and the Oversight Board for not going along with Ruth Atkin, Kurt Brinkman and Nora Davis in supporting the loan discount. Time for a big change at city hall…. I agree. Now comes the November election wherein the current Council will try to change Emeryville to a Charter City. That means more money for them to pick from our pockets, and squander. I say down with the change. We are just fine the way we are. We all know what crooks Nora Davis and her cronies Kurt Brinkman and Michael Biddle are, that there’s really no surprise. I hope the grand jury discovers whatever it is these crooks were paid by Madison Marquette to orchestrate this deal. The fact that Ruth has been exposed as just another gonif like the rest of them is disappointing. Ruth, you bring shame upon our people. A real shandah, you can kush meir en tuchus, you’ll never get my vote again. The main reason why I totally support a charter city vs. a general law city is that voters will vote for their mayor. Not this round of musical chairs. And since it’s apparent that the city is not collecting the proper fees for traffic impact and development, then generating income from a transfer tax is totally reasonable, not pickpocketing. Pickpocketing only occurs when one is not paying attention. Why do you think the grand jury report came about anyway? Because a concerned resident/taxpayer brought it to their attention. Thanks to the Secret News for exposing this. I think the Grand Jury has validated what many have been saying for quite some time here. To those paying attention, we’ve known all along the needs of developers come first in this city. What a rotten crew we have at City Hall. We deserve better.